Executive View from Silicon Valley: Is your leadership hurting your organization? Is your leadership hurting your organization? In my work, I enjoy looking for opportunities where not only can I make impact, but where I can also learn from others. In pondering such an opportunity, I found a great article in Inc magazine that had me thinking about the views that people have around leadership. In the article, 4 key signs of leadership failure are discussed. Read the article and feel free to share your opinion and let me know if you agree or disagree. 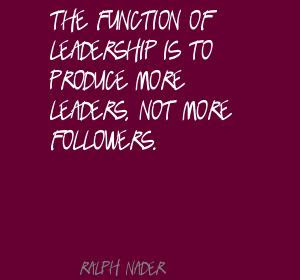 My quick take, however is to look at it a different way, the way attributed to Raph Nader "The function of leadership is to produce more leaders, not more followers." This seems self-evident to me, however I realized that others may not see it that way, and it does matter from your frame of reference. If you subscribe to the method of leadership that states that fear drives people and that great leaders should be feared, than we would be at odds. That said, I would challenge the leadership by fear believers to compare the market growth and market capitaliation of leadership by fear regimes to those based-on developing a culture of leaders. My non-scientific counting on fingers had the fear-based technique as non-scaleable and leading to low to negative growth.